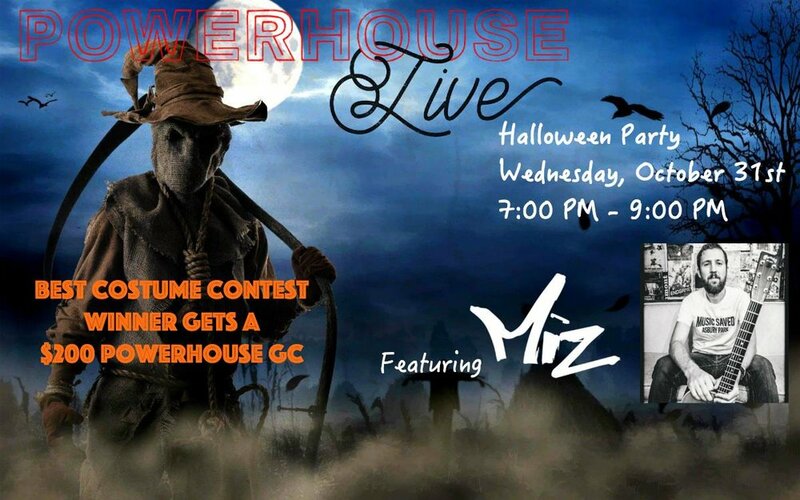 Come dressed to win and join the Powerhouse crew this Halloween for their 1st annual Halloween Party! Natalie will be there with her Costume and FREE Pumpkin Spice Kombucha for all attendees! This not to miss, two-hour event will feature give-a-ways, free Pumpkin Spice Counterpart Kombucha and a costume contest with the winner taking home a $200 Powerhouse Gift Card! Come for drinks and apps or try an entree from the brand new Powerhouse Fall menu. All this and LIVE acoustic jams at the bar with local legend MiZ. About Miz: MiZ is an Americana / Roots Rock artist known for masterful guitar playing, well-crafted songwriting, and powerful and energetic live performances. Mike Mizwinski, better known simply as MiZ has been privileged to play out since the age of 15. He has opened for acts like Jason Isbell, The Wallflowers, Blues Traveler, Derek Trucks, America, Kenny Wayne Shepherd, Lukas Nelson, Shawn Colvin, Leon Russell, Chris Isaak, Peter Wolf, Southside Johnny and the Asbury Jukes, Jackie Greene, Railroad Earth and many more.